DLR's "Formation flight for in-Air Launcher 1st stage Capturing demonstration," or FALCon, received 2.6 million euros ($3 million( from the European Commission to study a new way of recovering launcher first-stage boosters. WASHINGTON — The Germany space agency DLR is beginning a study this month on a reusable launcher concept that would use a winged first-stage booster captured on descent by an aircraft and towed back to land. DLR said March 20 that the three-year study seeks to develop a "rocket catcher" with an international team that will build on previous DLR simulations and flight experiments. The project is called FALCon, or the "Formation flight for in-Air Launcher 1st stage Capturing demonstration." In an interview, Martin Sippel, DLR's FALCon project leader, said the European Commission granted 2.6 million euros ($3 million) for the project — a small amount in the world of launchers, but one that he expects will go far, since early tests call for flight demonstrations with unmanned aerial vehicles and not rockets. Sippel said the idea of capturing a rocket stage on descent came from evaluations of how to save mass on the rocket. Landings like those SpaceX conducts with the Falcon 9 booster require extra fuel to propulsively slow the vehicle when it returns to Earth. By equipping a booster with wings and gliding it to a recovery aircraft, the rocket stage can use more fuel to deliver a payload into orbit, Sippel said. "If we tow it back, we save on the mass of the complete propulsion system for fly back," he said. "That provides a performance advantage." Sippel said the FALCon program is in its early days, and full costs for the project have not been finalized. If the results of the study are promising, DLR will consider pitching it for the European Space Agency's Future Launchers Preparatory Program, he said. Two years ago, ESA added the French space agency CNES' Prometheus reusable engine program to the Future Launchers Preparatory Program — a step that put the engine on a path that could culminate in its introduction on Europe's Ariane 6 or another next-generation rocket. Sippel said FALCon is not totally dependent on the European Commission for funding. Other program partners will contribute to the program, he said. DLR's partners on FALCon are the Institute of Mechanical Engineering at the Bulgarian Academy of Sciences, Drone Rescue Systems of Austria, Embention of Spain, soft2tec of Germany, the von Karman Institute for Fluid Dynamics of Belgium, and Astos Solutions Romania. Sippel said the FALCon road map is preliminary and will be developed in more detail as the project progresses. "Assuming we are successful in getting funding, then we could develop to, say, at least a [Technology Readiness Level] of 6 by 2028, so it could be ready for a next-generation reusable first-stage [that could be] operational in 2035," he said. "That's a rough road map." 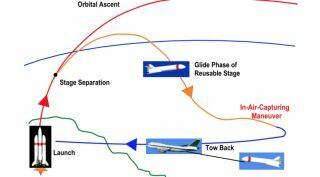 DLR is not alone in seeking alternatives to propulsive landings for reusability. United Launch Alliance has outlined a first-stage engine recovery approach for Vulcan, its next-generation rocket, that involves an inflatable hypersonic decelerator, a parafoil, and a midair retrieval by helicopter. Airbus, which builds Europe's Ariane 5 and future Ariane 6 launchers through a joint venture with Safran, proposed in 2015 a winged system for flying back first-stage engines, though Airbus said the approach reduced the amount of payload a rocket could carry compared to an expendable rocket. In a 2018 paper, Sippel and other FALCon partners wrote that projections of the in-air capture method show it could result in smaller reusable vehicles with no payload penalty when compared to winged fly-back approaches. In the paper, Sippel and his co-authors wrote that the most promising capturing technique involved using an "aerodynamically controlled capturing device" that an aircraft would tow underneath it. The device would link with the rocket stage as it descends, providing some distance between the aircraft. Sippel and the co-authors proposed using an unmanned, autonomous aircraft for the rendezvous at an altitude between two and eight kilometers. "Used, refurbished and modified airliners should be sufficient for the task," they wrote. Sippel said the FALCon name, while similar to SpaceX's Falcon 9 rocket, had a different source of inspiration. "It's not anything to do with the Falcon rocket of SpaceX," he said. "What is behind FALCon is really the Falcon bird. The Falcon bird goes into a dive maneuver to capture other birds or animals, so it is really inspired by the Falcon bird."